The arts also received much attention. 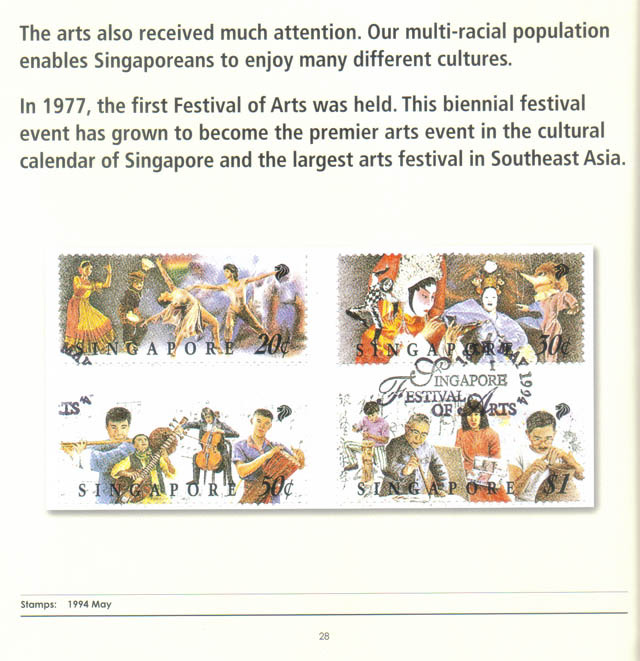 Our multi-racial population enables Singaporeans to enjoy many different cultures. In 1977, the first Festival of Arts was held. This biennial festival event has grown to become the premier arts event in the cultural calendar of Singapore and the largest arts festival in Southeast Asia. Another initiative to improve the quality of life came in the form of sports and games. Sports stadiums and swimming complexes were built in the HDB satellite towns. In July 1973, the National Stadium was opened. 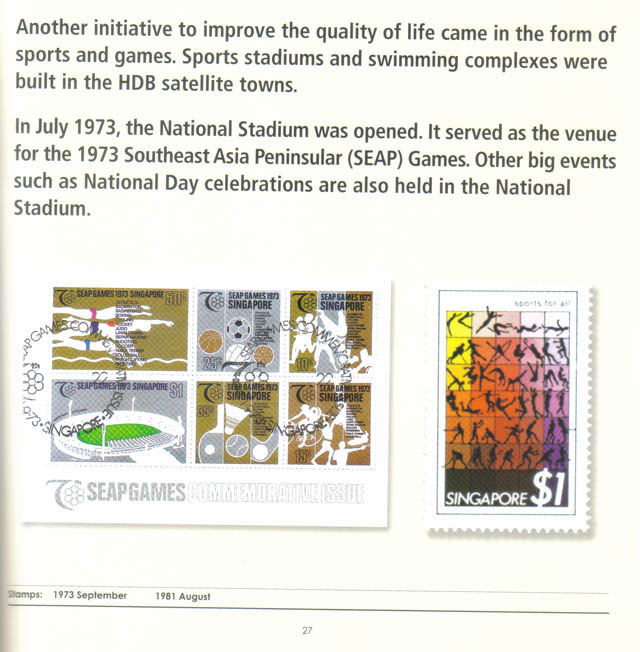 It served as the venue for the 1973 Southeast Asia Peninsular (SEAP) Games. Other big events such as National Day celebrations are also held in the National Stadium. 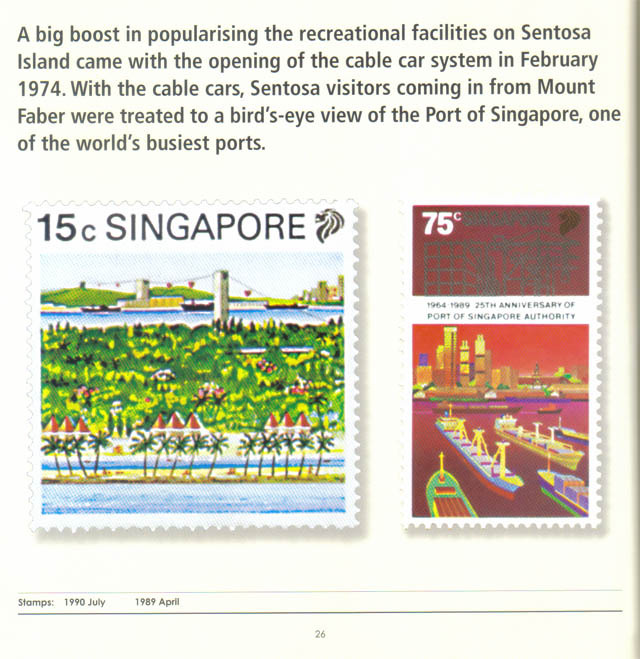 A big boost in popularising the recreational facilities on Sentosa Island came with the opening of the cable car system in February 1974. With the cable cars, Sentosa visitors coming in from Mount Faber were treated to a bird’s-eye view of the Port of Singapore, one of the world’s busiest ports. Educational and recreational facilities were additional resources to improve the quality of life. 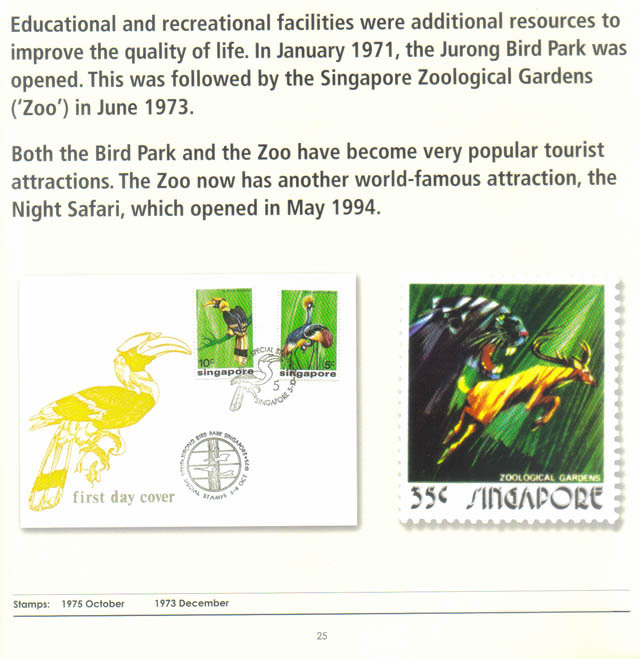 In January 1971, the Jurong Bird Park was opened. This was followed by the Singapore Zoological Gardens (‘Zoo’) in June 1973. Both the Bird Park and the Zoo have become very popular tourist attractions. The Zoo now has another world-famous attraction, the Night Safari, which opened in May 1994. To promote a green environment, trees were planted whenever a new building was officially opened. However, this process of adding to the greenery of Singapore was very slow. 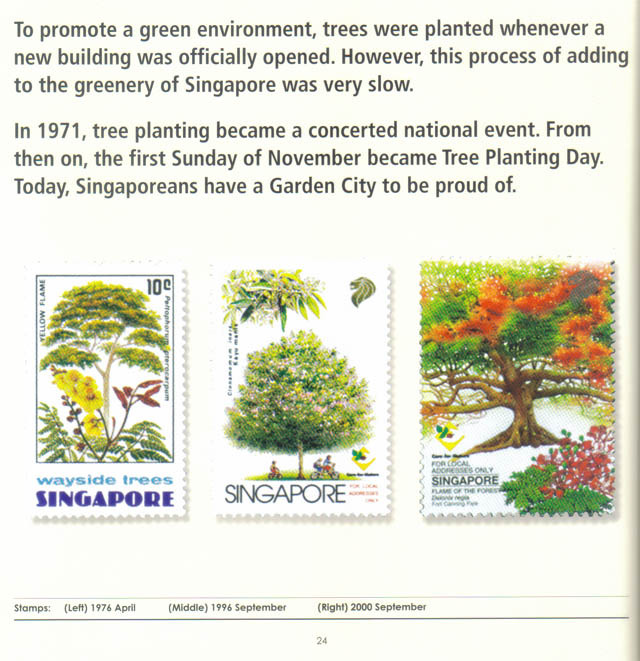 In 1971, tree planting became a concerted national event. From then on, the first Sunday of November became Tree Planting Day. Today, Singaporeans have a Garden City to be proud of. With the ‘hardware’ policies (jobs, housing, defence and international relations) in place, the government launched ‘heartware’ initiatives to give Singaporeans a better quality of life. 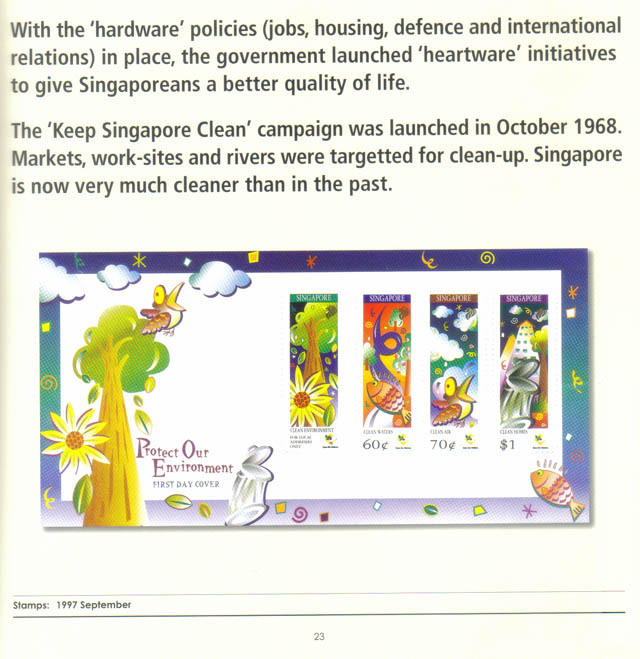 The ‘Keep Singapore Clean’ campaign was launched in October 1968. Markets, work-sites and rivers were targetted for clean-up. Singapore is now very much cleaner than in the past. The men who serve in National Service come from different races, religions, educational levels and income backgrounds. 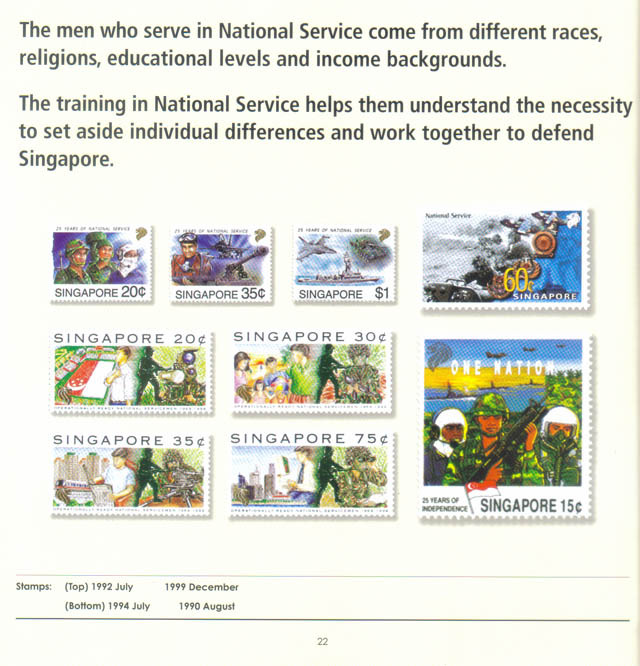 The training in National Service helps them understand the necessity to set aside individual differences and work together to defend Singapore.